Where we did we leave off? Oh, right, we learned about how to use variables in Python. Here is the second essential topic that you have to learn if you are going to use Python as a Data Scientist: Python Data Structures! How to install Python, R, SQL and bash to practice data science! Why care about Python Data Structures? Imagine that you have a book on your desk. I have one on mine: P. & A. Bruce: Practical Statistics for Data Scientists. If I want to store this info in Python, I can put it into a variable. 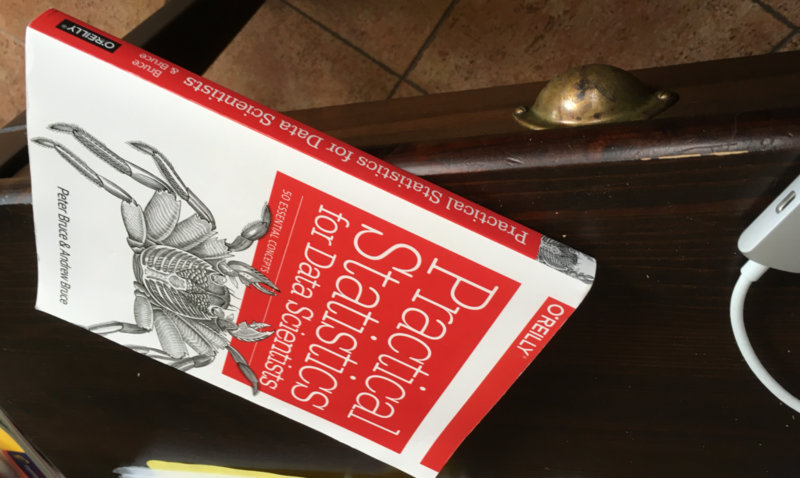 my_book = "Practical Statistics for Data Scientists"
my_book3 = "A Game of Thrones"
Are you seeing the problem? Sometimes in Python we need to store relevant information together in one object – instead of several small variables. This is why we have Data Structures! Let’s dig into the practical details! Start with the simplest one: Python lists. 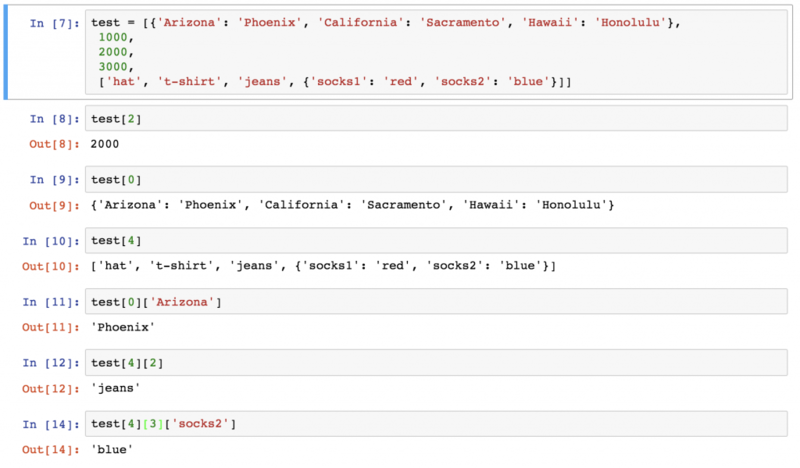 A list can hold every other type of data, not just integers – strings, Booleans, even other lists. Interesting, huh? Do you remember Freddie, the dog from the previous article? Now let’s say that Freddie has two belongings: a bone and a little ball. We can store those belongings as a list inside our first list. Actually we can do this list-in-a-list thingy infinite times – and believe it or not, this simple concept (the official name is “nested lists,” by the way) will be essential when it comes to the actual Data Science part of Python – e.g. when we create some multidimensional numpy arrays to run correlation analyses… but let’s not get into it yet! The only thing you should remember is that you can store lists in lists. Do you feel scientific? You should, because you have just created a 3-by-3 2D matrix. How to access a specific element of a Python list? Now that we have stored these values, it’s really essential to know how to access them in the future. 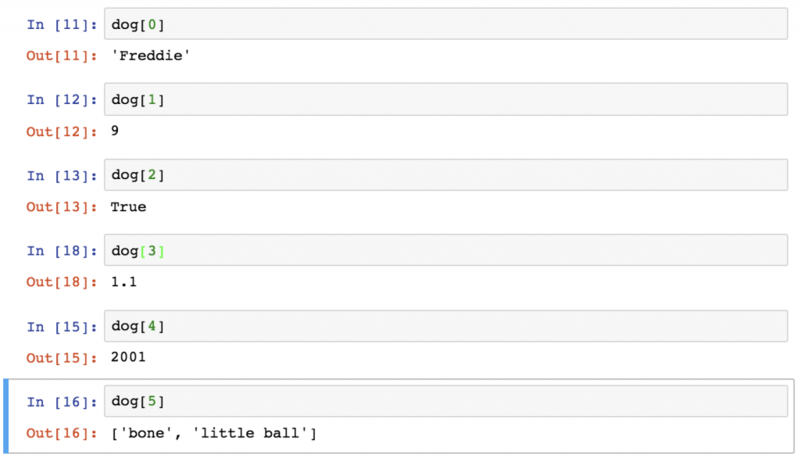 As you have already seen, you can get the whole Python list returned if you type the right variable name. What??? 9 was the second element on the list, not the first. Well, not in Python… Python uses so-called “zero-based indexing”, which means that the first element’s number is , the second is , the third is  and so on. This is something you have to keep in mind, when working with Python Data Structures. But here’s a detailed example! Twisted… But you will get used to it! One more thing about Freddie! We want to print his belongings one by one! Can you find out how to get the ‘bone’ element, which is located in a nested list? Actually it’s super-intuitive. If this is not 100% clear yet, I suggest playing around a bit with the sample_matrix = [[1, 4, 9], [1, 8, 27], [1, 16, 81]] data set and you will learn the trick! One more trick you might wanna know about! You can use a colon between two numbers in your brackets, so you can get a sequence of list items. We’ll get back to this feature later in details! This is everything you need to know about Python lists for now! What is a Python tuple? First of all: as a junior/aspiring Data Scientist, you don’t have to care too much about tuples. If you want you can even skip this section. A Python tuple is almost the same as a Python list, with a few small differences. Syntax-wise: when you set up a tuple, you won’t use brackets, but parentheses. A Python list is mutable – so you can add, remove and change items in it. On the other hand, a Python tuple is immutable, so once it’s set up, it’s sort of “set in stone.” This strictness can be handy in some cases to make your code safer. Python tuples are slightly faster than Python lists with the same calculations. Again: none of the above will be your concern when you just start off with Python coding, but it’s good to know at least this bit about tuples. Dictionaries are a whole different story. They are actually very different from lists – and very commonly applied and useful in data science projects. These are the values that we want to store about a dog. In a dictionary you can attribute a key for each of these values, so you can understand better that what value stands for what. As you can see, a nested list (belongings in this example) as a value in a dictionary is not a problem. And this is how a Python dictionary looks! Here’s the most important rule to remember when it comes to accessing any element of any kind of Python data structure: whether it’s a list, a tuple or a dictionary, you can print a specific item by typing the name of your data structure (eg. dog) and the unique identifier of the element between brackets (eg. ). The same goes for dictionaries. Note 2: maybe you are also wondering if you can return a key by inputting a value and not just a value by inputting a key. Bad news: it’s not possible – Python is simply not made for that. Copy-paste this super-nested (and super nasty) Python list-dictionary mutant into your Jupyter notebook and put it into a variable called test! Solve these 6 small assignments – by printing specific items from the list/dictionary above! It’ll start easy, then it’s gonna be harder and harder! Exercise #1: Return 2000 on your screen! Exercise #4: Return the word 'Phoenix' on your screen! Exercise #5: return the word 'jeans' on your screen! Exercise #6: Return the word 'blue' on your screen! test –» The only trick here is the zero-based indexing, so in our list 2000 is in the 2nd place in Python terms. test –» This will print the whole dictionary from our main list. test –» Same as the previous two – it will print the nested list. test['Arizona'] –» This is basically the next step of exercise #2 – we are calling the 'Phoenix' value with its key: 'Arizona'. test –» And this one is related to exercise #3 – referring to'jeans' by its number – don’t forget the zero-based indexing. test['socks2'] –» And one more step – calling the item of a dictionary of a nested list within a list – by its key: 'socks2'.